Today in the culture of modern society, on the one hand, the negative attitude to totalitarianism is declared, on the other hand, there is real danger of its restoration. Some countries have endured the totalitarian period in their history, so the question of need of overcoming such a past as well as question of steady attitude towards this past are evident. These processes, followed by radical change and revaluation of values, which has revolutionary character. Experience of Germany matters for judgment not only a problem of overcoming the totalitarian past, but also and a problem of the relation to the existing complex of guilt for the mass crimes committed by Nazis in days of Hitler’s regime. The analysis of culture of judgment and ways of revolutionary overcoming the totalitarian past of Germany in the context of historical development of the German state is of particular importance for Russia. 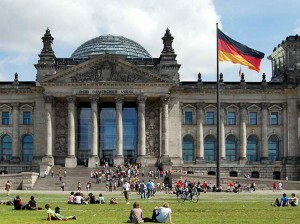 Experience of Germany can become an example for development of political and historical culture. The fact that the discussion concerning “a problem of guilt and responsibility” in Germany was social and political, causing a controversy and the conflicts in society, but not especially scientific that allows to consider her as the fact of historical culture is of particular importance and causes an opportunity to study the population relation to a phenomenon of revolutionary overcoming the past. “The problem of guilt and responsibility” appears in post-war Germany. Both have caused it: foreign policy, and internal political processes. On the one hand – defeat in the war launched by Hitler’s regime which result was not only crash of national socialism, but also loss of the German statehood, unprecedented crimes of Nazis, reaction to which was a program of a denazification begun with the countries winners and in many respects imposed to Germany. On the other hand – consciousness of Germans: desire to realize consequences of events of the Nazi regime and degree of the guilt, the involvements in the event or the aspiration to remove from itself responsibility. Development of “the problem of guilt and responsibility is has two main points of view in a social and political discussion in a question “who after all has to bear responsibility for crimes of Nazis: all Germans or only heads and functionaries of the party”. While the correspondence trials carried out party members to the GDR indicative, often, in FRG the possible complex of understanding and overcoming guilt, which West Germany recognized, was developed. It is possible to tell that the problem of guilt and responsibility goes to the GDR on a background while the social and political discussion that will last up to association, which is until the end of the 80th, develops in FRG. Christian consciousness of most of Germans became one of the most important internal factors of formation of a problem of guilt and responsibility. Need of repentance, refusal of former acts, reconsideration of the life – the main ways of overcoming a complex of guilt in Christian understanding. Not all Germans were ready to admit the guilt and to regret. After reunification of FRG and the GDR there is a revaluation of values, collision of opinions and views again, changes, including, and the relation to a problem of guilt and responsibility for crimes of Hitler’s regime: the integrated country needs overcoming both the Nazi, and communistic past. This entry was posted in Social on 27/09/2018 by Mary.